This combination of pictures created on June 03, 2018 shows US rapper Eminem at the 2018 iHeartRadio Music Awards and American-Trinidadian rapper Nicki Minaj at the 2018 Met Gala. 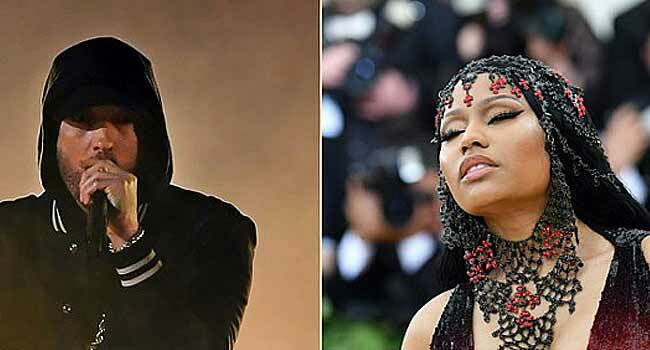 Eminem on Sunday fueled rumors that he was dating Nicki Minaj, creating an ultimate hip-hop power couple — and one which few would have anticipated. The eight-year-old Governors Ball drew some 150,000 people over three days to the city’s tiny Randall’s Island. Other performers included garage-rocker Jack White, boisterous rap star Travis Scott and fast-rising pop singer Halsey.